We also publish a growing library of technical manuals for industry practitioners. A wide range of beef and veterinary-related images are also available for purchase and download on our site. 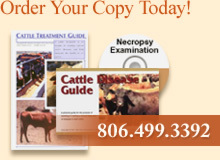 Palo Duro Consulting along with Agri Research Center, Inc provides a multi-purpose veterinary practice specializing in beef feedlot consultation and pharmaceutical product evaluation.